Limitations—–even in choice of wardrobe—–fuel the creative fires of Dutch master Karel Martens. His influential graphic design career spans nearly half a century, and he continues to explore new ground. An early Van Loghum Slaterus cover for Alexander Mitscherlich’s Society Without the Father. A poster for a film series celebrating Dutch documentary filmmaker Joris Ivens. A series of Dutch telephone cards. The Philharmonie in Haarlem, a collaboration with composer Louis Andriessen that resulted in the creation of a 18-panel sonogram across the building’s facade. Martens’s iconic targets punctuating the exterior panel of the Amstelveen Cultural Center. 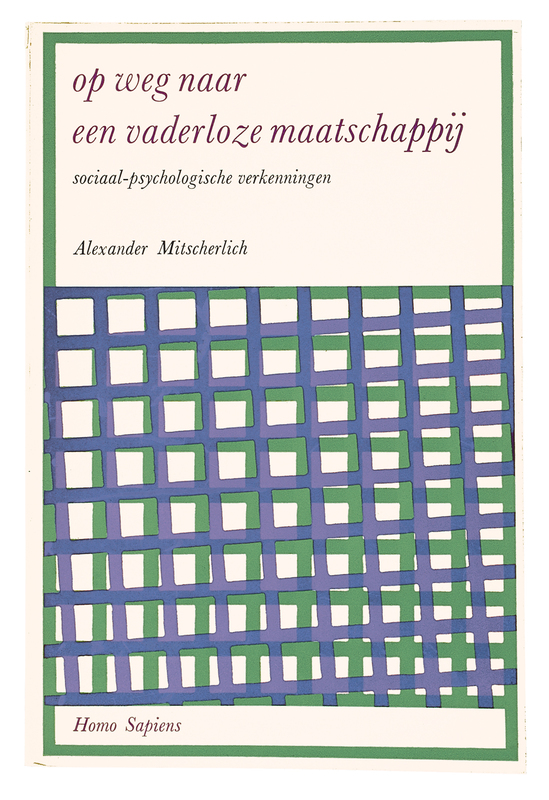 The cover of Martens’s award-winning monograph, Printed Matter. A cover for OASE, the architectural journal Martens has designed (with the help of various students) since 1990. A photograph of the exterior of Werkplaats Typografie in Arnhem, where Martens has taught since 1998. A proposed concept for a Dutch postage stamp celebrating Australia’s bicentennial. A monoprint from the Stedelijk Museum’s archive cards. A poster for an architectural lecture series. A birth announcement for Martens’s grandson. Martens in his famous blue coat. Cover of the Korean graphic design magazine GRAPHIC, whose ninth issue was dedicated to Werkplaats Typografie. 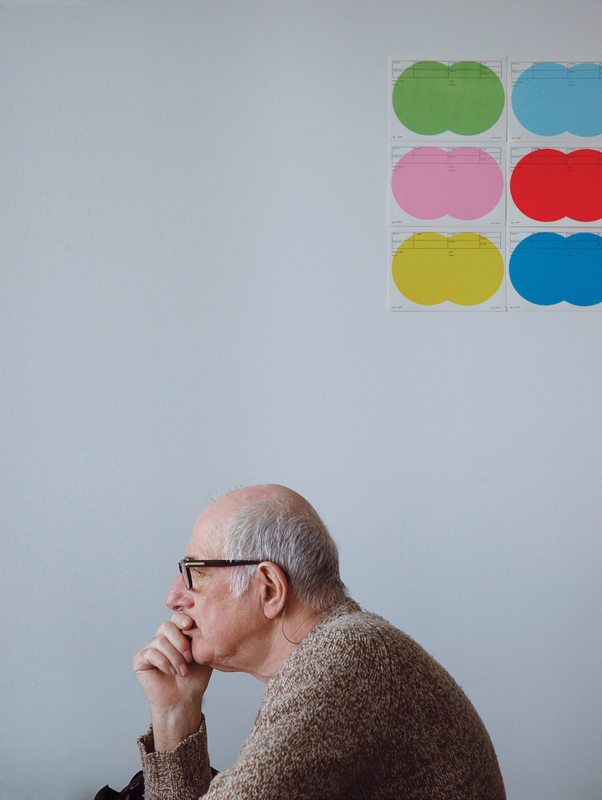 Limitations—even in choice of wardrobe—fuel the creative fires of Dutch master Karel Martens. His influential graphic design career spans nearly half a century, and he continues to explore new ground. He is visiting Yale University—–as he has done every year for three weeks since 1997—–to work with first-year MFA students. He has staked out a corner of the program director’s office, perching his computer on top of a print-littered table. He pauses to check that the keys he has tethered to his belt loop are still attached, explaining that he recently locked himself out of the office while his computer was inside. His glasses, too, are fastened by a makeshift leash. The simple string tied in a knot at either end of each eyeglass arm, along with Martens’s considerable body of work, shows that making do is often best for making. In addition to his print work for various publishers, Martens also produced designs for the Dutch government throughout the ’80s, ‘90s, and into the ‘00s for coins, postage stamps, and telephone cards, among other things. He’s also worked three-dimensionally, creating signage and the occasional building facade, like the Veenam Printers Ede building and the new extension for the Philharmonie building in Haarlem. The role of the graphic designer has grown, so when the director of the Academy of Fine Arts in Arnhem approached Martens and Wigger Bierma to head a postgraduate program in graphic design, Martens proposed that it operate as a fully functioning studio. Martens and Bierma imagined that students would work alongside professors on commissioned work—–in effect, all program participants would get their hands dirty. They opened Werkplaats Typografie (WT) in the fall of 1998 and invited five students to join them in a former radio distribution center in northern Arnhem. True to his vision, Martens has since invited his students to help him design the architectural journal OASE, whose appearance he’s guided since 1990. As Printed Matter and Wonder Years assure Martens his place in the canon of graphic design, he approaches the adulation as a kind of reflective exercise, a chance to celebrate what drives his work. Sparsity, limitation, constraint—–however you choose to describe his approach, you’d be hard-pressed to find a designer who could make anything more of it.